One of the notorious famous clubs at Yale is the Skull and Bones. Many important people in history has belonged to this secret organization. It symbol is a Skull and Crossbones with the number 322. One theory is that the number 322 is for the day it was started 1832 and its participation in the second chapter of the Illuminati. The Skull and Crossbones are the symbols for the Jolly Rodger and the Templars. The Templars were said to be buried with their legs cross. The number 32 pops up in connection with the Scottish Rite Freemasonry. 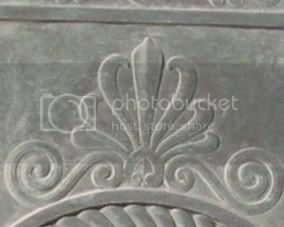 I found this symbol on front of the door at the Scottish Rite Temple in Saint Louis Missouri. "And the LORD God said, "The man has now become like one of us, knowing good and evil. He must not be allowed to reach out his hand and take also from the tree of life and eat, and live forever." This quote creates much discussion about who exactly is the "Us" to which God is referring. Some people believe it refers to the extraterrestrial council. A heavenly council determining if we should be allowed to share in their knowledge. The judgment seems that man will not be allowed immortality and be kicked out of the Garden of Eden. People who believe in the Atlantean civilization which existed in ancient times only to be destroyed by some cataclysm of nature or of their own making. Is the Skull and Bones 322 referring to this passage in the Bible. It is a possibility. Gerard de Sede a writer wrote that the Merovingians were descendants from extraterrestrials from Sirius. 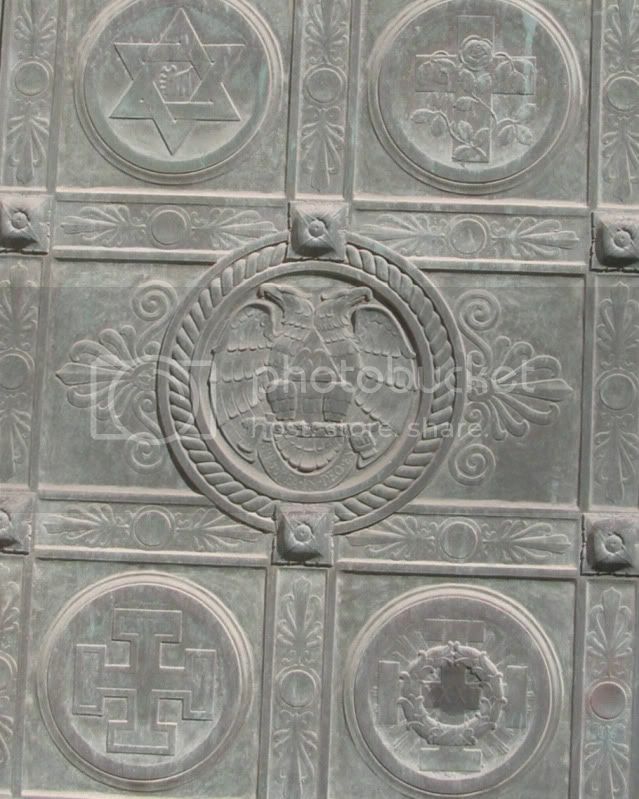 The Scottish Rite door has symbols of many secret societies who are interlinked with each other. Saint Louis is known as the Gateway to the West and Rome of the West. In Freemasonry the Royal Arch is a high step in the order. Saint Louis has its own Royal Arch next to the Old Saint Louis Cathedral dating back to the early days of the Frontier. The Mississippi river was the major highway for goods to be moved through the frontier. The Arch is the symbol of the Priory of Sion. Plantard talked about an North American side of the Priory which he seemed to disagree with. The Arch is reflected over the waters of the Mississippi and when the sun sets in the west one can see the Star (Sun) in the middle. It is a sign of peace and wisdom. It has a connection with the number 22 is the sum of its sides. It guides the Ark to the star. In Paris the Arch de Triumph is the structure who we also see the sun sets in the west. 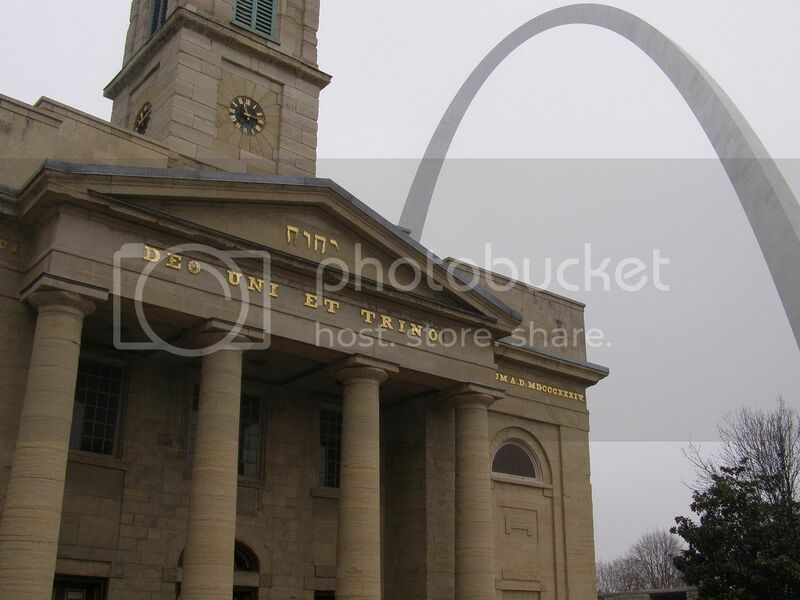 You can see next to the Arch in St Louis is the Triangle with the Hebrew letters of the Tetragramaton. At the Arch de Triumph in Paris it is aligned with a golden capstone pyramid obelisk from the land of Egypt. The Arch of Titus in Italy tells the tale of the spoils of Jerusalem being brought to Rome after destruction of the temple. It shows the great golden Menorah being brought to Rome. 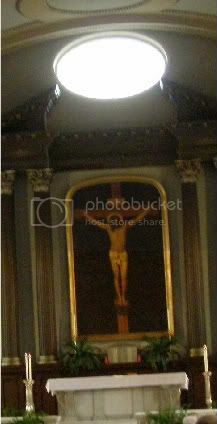 Pilate had a notice prepared and fastened to the cross. It read: JESUS OF NAZARETH, THE KING OF THE JEWS. Many of the Jews read this sign, for the place where Jesus was crucified was near the city, and the sign was written in Aramaic, Latin and Greek. 21 The chief priests of the Jews protested to Pilate, “Do not write ‘The King of the Jews,’ but that this man claimed to be king of the Jews.” Many believe that Jesus is connected to the Northern Essenes group located near Mount Carmel. John the Baptist was connected to the Qumran Essenes who were the Baptizers. Many archeologists have trouble finding the ancient town of Nazareth. It is not mentioned in the Old Testament. In Northern Israel there was a possible area at the bottom of Mount Carmel and near the Sea of Galilee. Society of the Propagation of the Faith and the Association of the Living Rosary. She donated her fortune but alas placed it in corrupt hands of Abbe Inglesse. He later stole her fortune as well as money from donors. Pauline was left destitute but the organizations changed the world and still exist today. Pauline was born on July 22,1799 the same day as Magdalene's feast day. This date July 22 is a very important date in the Rennes Chateau legend. It was July 22 that Marie Dernaud sold the Rennes Chateau estate to Noel Corbu. Berenger Sauniere (abbe of Renne Chateau) died on January 22. The Old Saint Louis Cathedral was built with the help of the Vincentians. A plaque is on the wall of the Old Cathedral attesting to the connection between the early Vincentian missionaries from Saint Mary of the Barrens. Bishop Dubourg was visited by four Indians from the Rocky Mountains inviting the priests to come to their lands. The Indians died of disease and were baptized on their beds by Father Roux and Father SAULNIER. Is it coincidence that Father Saulnier and Abbe Sauniere have such similar names? It makes one wonder if there is a relation. Abbe Sauniere wore his habit in a similar fashion to the Vincentians such as Saint Vincent De Paul. I one of his few remaining pictures of Abbe Sauniere is one wear he wears a cord tied around him and a triangle with two tassels fall over his chest. Saint Vincent has been painted using the same technique. Saint Vincent belonged to a secret society called Compagnie du Saint -Sacrement with Olier of Saint Sulpice. At Rennes-le-Chateau, the Magdalene at the altar has her hands placed in a symbolic way. 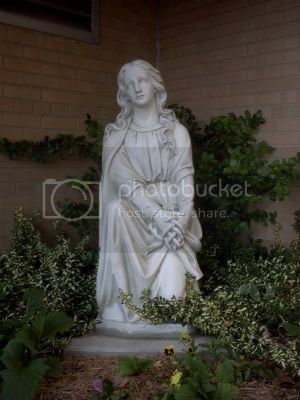 It is in Saint Louis where I found a Magdalene statue whose hands also were folded in the exact way. I found the hands also on Mary on a picture of the Crucifixion at the Vincentian Shrine of the Miraculous Medal at Perryville, Missouri. I found the hands also at Our Lady of Knock Shrine in Ireland which the Magdalene's hands were in the same manner. The Vincentians also have a special connection with Our Lady of Knock . Pauline Jaricot insisted that Pope Gregory XVI begin an examination for the beatification of St. Philomena, Saint Philomena remains were found in 1802 with a vial of blood. Many Miracles were attributed to the saint. Madeliene Sophia Barat founder of the Sacred Heart Society was a devotee of Philomena. Her hands have been damaged but on close inspection her hands resemble the hands of Magdalene at Renne Chateau and the Magdalene in Saint Louis. Just like the Magdalene at Our Lady of Knock her fingers have been vandalized. Saint Louis is headquarters for a International company which makes genetic modified seeds. It distributes these seeds throughout the world. A New World is being created by man by genetic engineering. Is man creating his own Garden of Eden from his great intelligence? It seems so. One must ask though did God create the world with profit on his mind. We are in the world of profits at all costs and that makes us wonder if this dangerous for mankind and the world. The warning is about the Tree of Life. Man through his intelligence has begun to genetically modify this Tree of Life (DNA) of seeds. Is this experiment going to aid in man's life span or perhaps may decrease it? Time will tell. 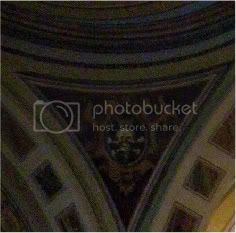 The Skull and Bones seems a good way to finish this story of which I found it in the Shrine of Saint Joseph in Saint Louis. Et in Arcadia ego or is it Et in Acadia ego?